• What is Piaget’s sensorimotor stage? • What is a primary circular reaction? • What is a secondary circular reaction? • In terms of Piaget’s stages, what is a scheme? • How do infants display object permanence? To watch the video Piaget’s Sensorimotor Stage, click on the screenshot below. After watching the video, answer the questions that follow. Describe the substages of the sensorimotor period in terms of each of the children you see in the video. 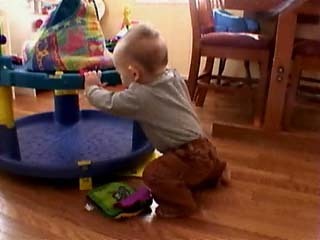 How do sensory and motor activities affect the development of cognitive skills? Which of the infants illustrates a tertiary circular reaction? How have the other stages of the sensorimotor period helped this child reach this level?